In “Missing Man,” SpongeBob, Patrick, and Barnacle Boy go on a desperately dumb search for a wayward Mermaid Man, annoying the hero's entire rogues gallery along the way. 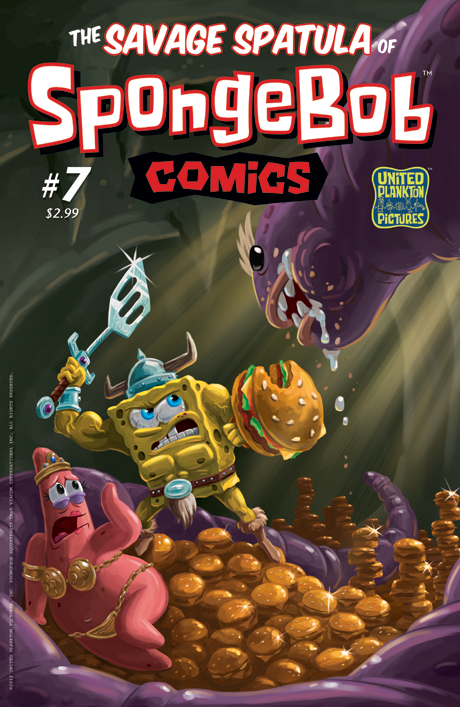 And SpongeBob becomes the champion of an underground civilization living beneath the Krusty Krab in “Look Out Below.” Also, Gary heaves a hairball, courtesy of James Kochalka (Dragon Puncher), and Squidward's clarinet playing gets an assist from Bob Flynn (Heeby Jeeby Comics). All this plus a Scott Shaw! (Simpsons Comics) ad-parody and a pin-up of this issue's sword-and-spongery cover!